For increase of employment of invalids in socially useful work and creation of new workplaces for invalids deputies of Saint Petersburg Legislative Assembly today, October, 16, have passed the law "About limitation of workplaces for employment of invalids in Saint Petersburg". 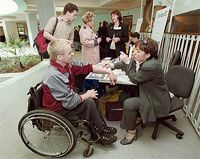 According to the law, the organizations, number of workers in which is more then 30, have the quota for employment of invalids in percentage to average number of workers (not less than 2% and no more than 4%). In case of failure or impossibility to execute the fixed quota of employment of invalids employers monthly should bring in the budget of city an obligatory payment for each not employed invalid, equal to average wages in Saint Petersburg. Business news archive for 16 October' 2002.